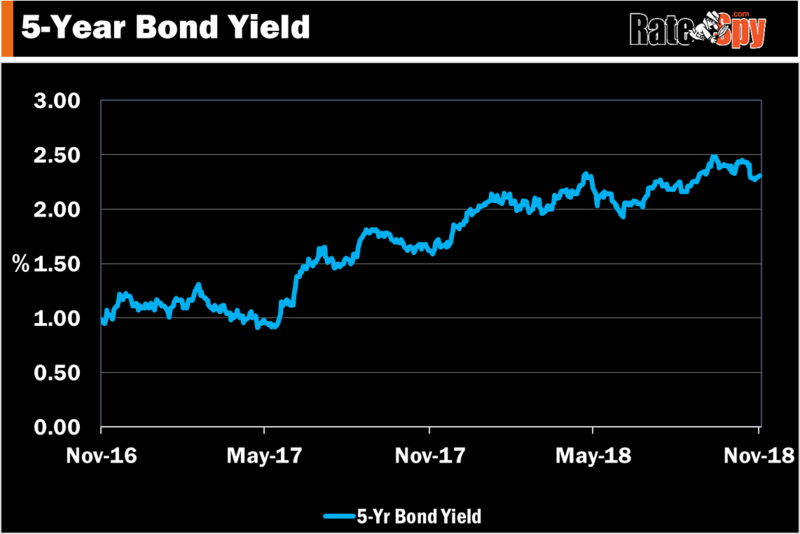 The smart guys betting billions of dollars on interest rates are pulling back their wagers on 2019 rate hikes. And if you believe those traders, the end of the current rate-tightening cycle may not be far off. The market is now pricing in just two more U.S. rate increases between now and the end of next year. That’s down from three in recent weeks. Canada probably won’t require more hikes than the U.S., given its dependency on American trade, our highly-leveraged consumer, plunging oil prices, weaker stock prices and other worries that keep economists up at night. In any event, the mood change is palpable and Canada’s 5-year bond yield has begun to reflect it. Yields are threatening to break a two-and-a-half-month low and finally take fixed mortgage rates down a notch. If headlines start to downplay future rate hike potential, we’ll see a bump in popularity among variable mortgage rates. More people will start doing the math, conclude that it’s worth gambling on fewer than five more hikes and float their rate. For those getting insured mortgages, the odds are even more stacked in their favour. There are brokers right now quoting a voluptuous prime – 1.37% for insured variable rates. With that kind of discount, the Bank of Canada would have to hike at least six times for you to lose versus a 5-year fixed (without even considering the higher penalty of a fixed rate). A borrower would have to be more risk averse than a bank in a housing crash to buck those kind of odds — at least at this point in the economic cycle. With that said, here’s an updated look at the lowest widely-available variable rates in Canada. Remember that rates vary greatly depending on your mortgage type, mortgage size, home value and qualifications. Mortgages not meeting all such criteria are uninsurable. Hi, can i ask which lender are offering insurable at 2.88% and uninsurable at 3.04%? Also, just to clarify, if a property is owner occupied and is a purchase at <$1M, with 20% down payment, it would qualify as insurable? And yes, an owner-occupied sub-$1M purchase with 20% down could qualify as insurable if it meets all the insurer’s guidelines. Are the 39/44% limits firm, or are exceptions sometimes made like with conventional uninsured mortgages? i.e. a retiree with high net worth but modest income. Hi Ralph, There are definitely lenders who will allow debt ratios above the normal 39/44 limit. If the borrower wants ultra low rates, however, the options are very limited.